Admit it. You can’t take your eyes off this object. 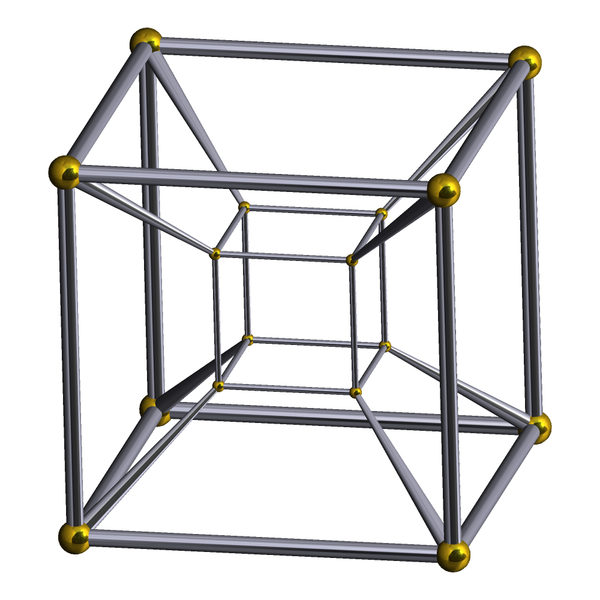 This is a tesseract and as such is a 4 dimensional shape. Wait, though. We only live in three dimensions, don’t we? So although this object is beautiful, hypnotising almost – what on earth is it and what is it doing here, confounding our lovely three dimensions with its impertinent fourth? Strictly speaking, what you can see above is a two dimensional projection of a three dimensional simulation of a four dimensional tesseract, that’s what. OK, at the risk of sounding like a certain Miss Anniston, now for the science bit. 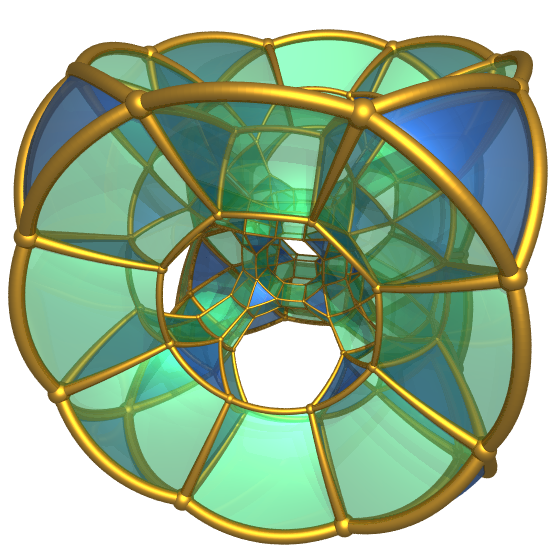 Tesseracts are pretty difficult things to describe, let alone understand. Here we go. 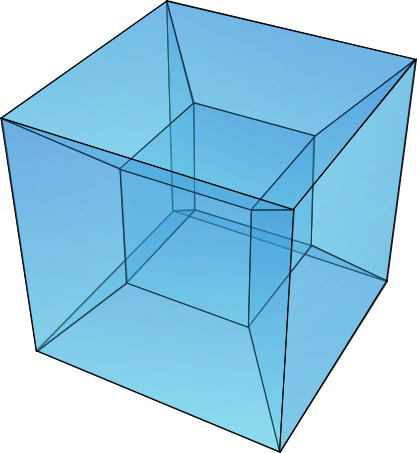 Essentially a tesseract is the equivalent of a cube, only it is represented within four dimensions (more of that trickster later). Think of the space with which you are familiar. Put simply; think of the ways in which you can move. There is left to right, forwards and backwards. Finally there is up and down. Three ways, three dimensions. You can pinpoint your location by working out your coordinates in those three directions. 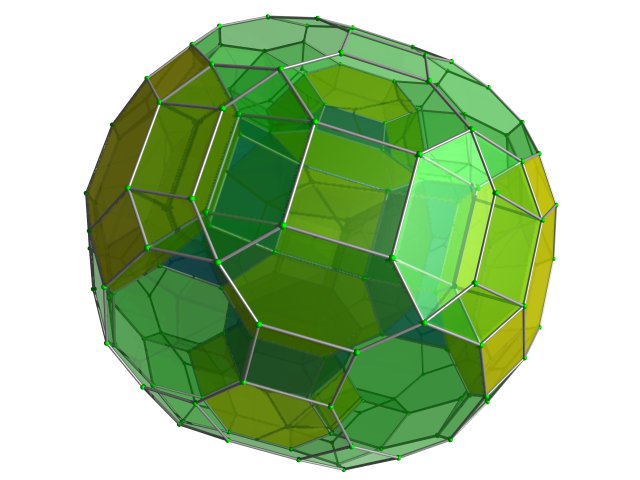 This particular type is known as a Runcitruncated tesseract. If your partner throws you off a cliff (for whatever reasons) you would be moving forwards, downwards and, depending on the direction of their thrust, either to the left or right. You would be moving within three dimensions. Now, these dimensions are all at right angles to each other – that is, a 90 degree angle (see left). Think of a capital L that you can rotate in any direction you want and you have a right angle. Let’s go now to the fourth dimension (and take it out of your head that the fourth dimension is time, it isn’t). 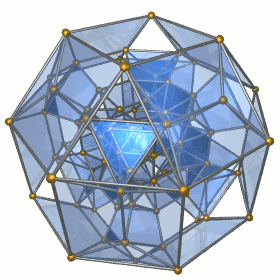 This gorgeous thing is an omnitruncated tesseract, just in case you didn't already know. When you go to the fourth dimension (cue Twilight Zone music) you have another direction. That direction is (wait for it) at right angles to each and every one of the three original directions. If your head just exploded, don’t worry. That is quite a normal reaction. Just take it from me that the math works. OK. 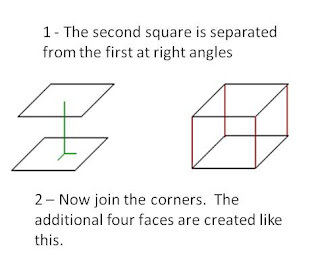 So first we go from a two-dimensional cube (which we call a square) to one made of three dimensions (a normal cube). Lay a square flat on whichever surface you want. A flat surface. Next, add another square above it (that is separated along the vertical direction). This is at right angles to any line you can imagine within the square. So now, just bring those corners together. The tesseract cometh. This is exactly the same idea. 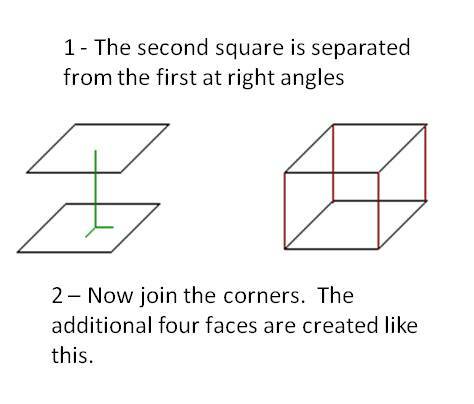 Bring another (but smaller) cube along and place it inside the first, so any line along the first cube is at right angles to the lines of the second. Did your head just explode again (even though that’s impossible)? This is what is known as separation along the fourth dimension. What we get is a tesseract. It is impossible to properly visualise in our three dimensional world but what we normally get to see is a small cube inside a bigger one. Much like this. As for the pesky fourth dimension, most people when asked will answer that it is time. In fact it is an abstract concept (as if you hadn’t already guessed from the above). Mathematicians (not to mention those philosopher types) have been generalizing the rules of 3D space for a couple of hundred years. For fun. Oh, and also for the insights that such a mind (expletive deleted) can offer. So, here, just use your imagination - go with the flow. It was Charles Howard Hinton, British mathematician, bigamist, jail bird and continent hopper who in 1888 first used the term. So if you are bewildered and want to blame anyone, go spit on his grave. 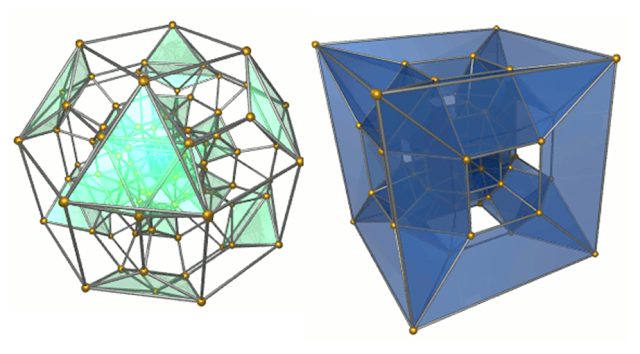 You might also have heard tesseracts referred to as hypercubes, but that is a story to generalize another day. Yet, when in doubt, turn to Carl Sagan. Although some argue with the shadow explanation, this is the closest that popular television has come to explaining the tesseract.